Let's zero in on GM's pension obligation, its peak vs plateau argument, and GMF. By now, you've likely heard that General Motors (NYSE:GM) recorded a pretty solid fourth quarter and full year. The automaker's fourth-quarter adjusted earnings per share jumped 17% to $1.39, which was far above analyst estimates of $1.20, according to Bloomberg. General Motors regained its No. 1 position in China, raked in the profits in North America, improved its profitability in Europe, all while dishing out $5.7 billion back to shareholders through its share repurchase program and dividends -- not a bad year at all. With that 10,000-foot view out of the way, there were some important details investors shouldn't overlook. Let's dig in. If investors think back before the past recession and General Motors' bankruptcy, the stock failed to perform very well in large part because investors were worried about GM's enormous healthcare and pension obligations. Investors had a right to be concerned then, but in part thanks to a unique bankruptcy and GM paying billions into its pension fund over the past seven years, it's slowly but surely becoming less of an issue. At the end of 2015, GM's total pension obligations shrank, and its percentage funded increased roughly 170 basis points. Chart source: General Motors' fourth-quarter earnings presentation. GM's U.S. pension obligation declined roughly $5 billion and its total global pension obligation declined about $9 billion, compared to 2014. Investors would probably like to see GM's pension funds closer to 85%-90% funded, but as it sits now, the automaker will probably only have to contribute between $500 million to $1.5 billion annually going forward, which is a night-and-day difference from pension plan contributions that often exceeded $4 billion annually in the years after emerging from bankruptcy. One reason automotive stocks have taken a serious beating in recent months is that many analysts and investors fear what will happen to automakers' profits once sales peak in the U.S. market. Not only are investors worried that automakers will return to their old ways of increasing incentives to protect market share, which will destroy profits, but investors are also wondering if automakers are truly prepared to match supply and demand during a cyclical downturn. Personally, these fears appear overblown to me, and GM agrees. During GM's fourth-quarter presentation, the company noted that because of supportive fundamentals -- the high age of the U.S. vehicle fleet, company used car pricing, credit availability, low fuel prices, better-managed inventories, better capacity utilization at plants, and lower break-even points -- that the U.S. economy can support a strong seasonally adjusted annual rate of vehicle sales of 17 million units going forward. In other words, GM believes we're in an environment that looks like the years following 2000 on the graph below, rather than the years following 2007. U.S. Vehicle Sales data by YCharts. Going back to GM's mention of lower break-even points, the automaker can now break even at a point of between 10 million and 11 million annual new vehicle sales in the U.S. market. 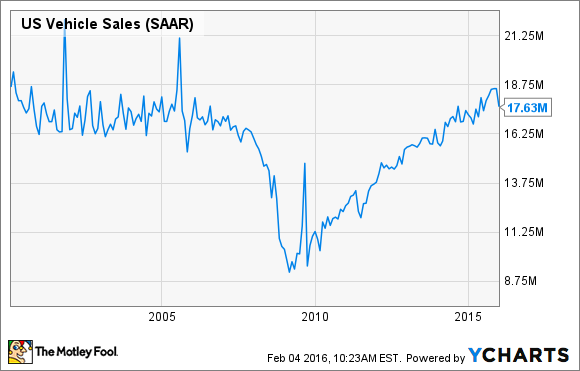 That was a level of sales only briefly tested even during the past recession. Further, GM proved it could significantly cut costs last year and is still on track to achieve roughly $5.5 billion of efficiencies by the end of 2018. Those are all details investors shouldn't overlook, and they're details that should keep investors optimistic despite the recent "peak auto sales" doom and gloom. One entity investors frequently skip over during GM's presentations is its banking entity: GMF. That's a mistake, though, because GMF can add incremental pre-tax income for the automaker without needing to sell more vehicles -- it just needs to expand the number of consumers it helps finance vehicles. Consider that GMF sales penetration of GM's retail sales in North America moved from 11% for full-year 2014, up to 29% last year. Globally, GMF as a percentage of GM retail sales moved from 21% in 2014 up to 34% last year. That increased penetration of sales enabled GMF to generate record fourth-quarter and full-year revenue of $1.9 billion and $6.5 billion, respectively. In 2015, GMF generated $837 million EBT-Adjusted, and the automaker hopes that will more than double to $1.8 billion EBT-Adjusted annually as soon as 2018. Ultimately, it was a strong fourth quarter and a great full-year for Detroit's largest automaker. However, it's clear that Wall Street is not high on automotive stocks right now, and the stock price of GM, as well as other automakers, are likely to trade at lower valuations until automakers prove they can indeed continue to generate strong profitability when sales do peak.